Handbook of Vegetables and Vegetable Processing, Second Edition is the most comprehensive guide on vegetable technology for processors, producers, and users of vegetables in food manufacturing.This complete handbook contains 42 chapters across two volumes, contributed by field experts from across the world. It provides contemporary information that brings together current knowledge and practices in the value-chain of vegetables from production through consumption. The book is unique in the sense that it includes coverage of production and postharvest technologies, innovative processing technologies, packaging, and quality management. 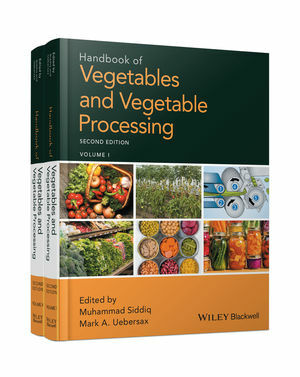 Handbook of Vegetables and Vegetable Processing, Second Edition covers recent developments in the areas of vegetable breeding and production, postharvest physiology and storage, packaging and shelf life extension, and traditional and novel processing technologies (high-pressure processing, pulse-electric field, membrane separation, and ohmic heating). It also offers in-depth coverage of processing, packaging, and the nutritional quality of vegetables as well as information on a broader spectrum of vegetable production and processing science and technology. This important book will appeal to anyone studying or involved in food technology, food science, food packaging, applied nutrition, biosystems and agricultural engineering, biotechnology, horticulture, food biochemistry, plant biology, and postharvest physiology. Muhammad Siddiq, PhD is Associate Professor in the Department of Food Science and Human Nutrition, Michigan State University, East Lansing, USA. Mark A. Uebersax, PhD is Professor Emeritus in the Department of Food Science and Human Nutrition, Michigan State University, East Lansing, USA.